The third night the youngest son, Ivan Tsarevich, guarded the tree. One hour went by, then a second, and a third ... Ivan was sleepy but took his job seriously and managed to stay awake. Suddenly the whole orchard lit up, as if a thousand lights were shining on it - the firebird was making its entrance! As the bird began to pluck golden apples off the tree one-by-one, Ivan sneaked up and grabbed it by the tail. But the bird managed to wriggle out of Ivan's grasp, leaving the youth with only a bright red tail feather. The feather was so luminescent that if it were brought into a dark room, the room would glow, as if illuminated by the setting sun. Ivan rode on and on until he reached a big stone standing in the middle of an open field. On the stone were the following words: "He who goes straight will be hungry and cold. He who passes to the right will be safe, but his horse shall die. He who passes to the left will be killed, but his horse will be safe." Choosing the lesser of three evils, Ivan decided to go to the right and rode for three days. Suddenly a gray wolf appeared out of nowhere and devoured the horse. For a long time, Ivan wept and eventually continued his journey on foot. He walked for an entire day and became very tired. The gray wolf suddenly appeared again. "I'm sorry I killed your horse," the wolf said, "and making you go all this way on foot. But it was God's will. Jump on my back, though, and I'll take you where you want to go!" Ivan, for some reason, began to trust the wolf now and told the animal that he needed to find the firebird. He climbed on the wolf's back and they sped off like a flash. Ivan did as the wolf instructed and had the bird in his hand, when he thought, Where am I going to put the bird if I don't take its cage? So he went back to get the golden cage and the minute he touched it, alarms went off and guards seized the lad. He was immediately taken to the tsar, who was furious and demanded an explanation. "I'm the son of Tsar Vislav" Ivan said, "and the firebird had been taking apples from my father's orchard every night. So he sent me to get the bird." "Well, if you had just come and asked me, I would have given the horse to you! But now how will it look when I tell the whole kingdom what you've done? However, to get your honor back, there is something that you can do for me. Go to the Thrice Tenth Kingdom and bring back the princess Elena the Fair. I want her, but I have not found a way to get her here. If you do this, I will pardon you and will give you the golden bridle." So Ivan, the princess, the wolf and the golden-maned horse began their journey to the kingdom of Dolmat. When they approached its border, Ivan said to the wolf, "Listen, my dear friend, you have done much for me, but could you do one more thing? I would love to have this golden-maned horse to bring back to my own kingdom. Could you turn yourself into a horse, and we'll do the same thing we did with the last tsar?" With his speed, it didn't take the wolf long to catch up with Ivan and Elena the Fair. 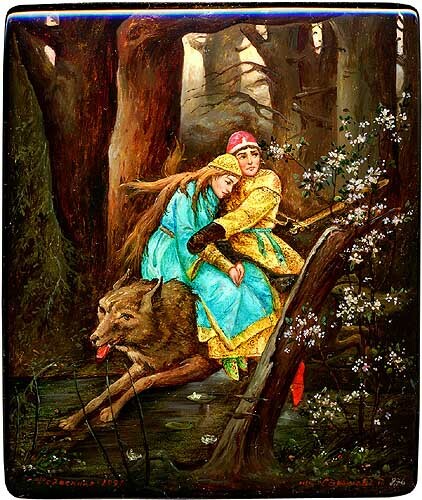 They traveled together until they reached the place where the wolf had eaten Ivan's first horse. "Now it's time to part," the wolf said. "You have a horse again and I can't be of any more service to you." The wolf ran off and Ivan shed many tears over the parting of his good friend and companion.